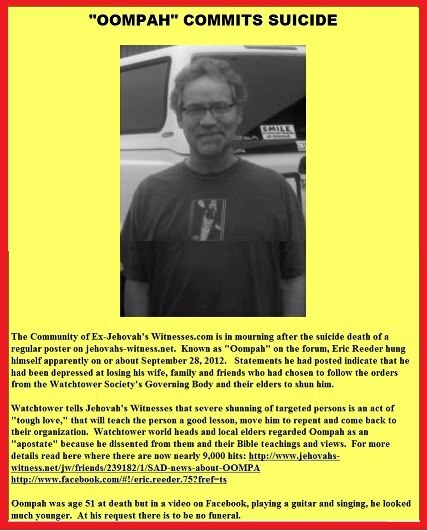 Oompah, also known as Eric Reeder, was a regular contributor to the ex-Jehovah’s Witness community. After losing all contact with his family due to being declared an apostate, he committed suicide. He was 51 years old. Post from Oompah at JWD just over a year ago about being disfellowshipped. Ironically, the religion and publisher of this statement is one of the biggest offenders with their shunning policy of its members who come to the conclusion that their form of worship is unacceptable. For some, this severe shunning is too much to bear. For anyone having problems leaving “the truth,” there are plenty of friends out there waiting to hear from you. Please consider reaching out to them. JWD is probably the biggest online forum for ex-Jehovah’s Witnesses out there. There’s also Ex-JW Secularists and JWR. And in the long run, there’s no shame in talking to a secular therapist or a any kind of therapist, either. Here’s an article about shunning for those who may have been told that Jehovah’s Witnesses don’t shun former members, or that Witnesses only do it out of personal choice and not in compliance with Watchtower teaching. 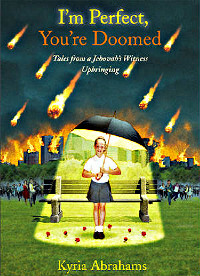 I recently finished reading Kyria Abrahams book, I’m Perfect, You’re Doomed: Tales from a Jehovah’s Witness Upbringing. Since I’ve used its cover image several times on my web site, actually reading it seemed fair. Here’s the thing I should have guessed from the cover: I’m Perfect, You’re Doomed isn’t a hate fueled rant or a whoa-is-me sob story. It’s a memoir that’s actually funny! Here’s what she has to say about her book. As ex-Witnesses, we’ve all read about situations where the Watchtower Society (or its representatives) claim that shunning a family member is purely a matter of personal choice. That is to say that the family members who shun disfellowshipped Witnesses aren’t being forced to do so, but simply chose not to have any relations with that person for reasons of their own. This makes the Watchtower Society seem less cult-like to the public and may help the organization avoid certain legal issues for the practice of disfellowshipping in other countries. The video above shows us an example of a Witness downplaying the Society’s role in shunning disfellowshipped Witnesses in a court of law. Notice how he ducks questions relating to whether the policy of disfellowshipping is enforced by the Society or how such enforcement might happen. There are other examples where the Society’s representatives seem evasive when it comes to answering uncomfortable questions in the media or in legal proceedings. The issue of blood transfusions is one that comes to mind. The claim, once again, is that the family is not being made to do anything by Watchtower policy. They are simply refusing treatment out of personal choice. Hence, it’s the family’s responsibility, not the Society’s. But here’s the big question. Is any of this really true?